The most charming alternative to treading the beaten trails of Venice is to choose the little-used side streets and bridges of this labyrinth- and canal-strewn city, thereby avoiding the usual floods of tourists. 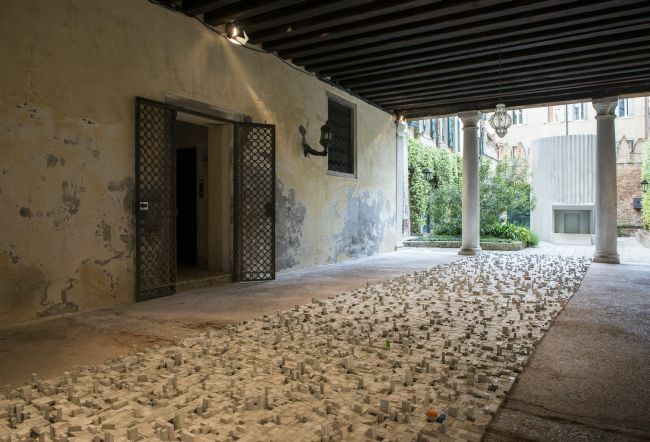 Similarly, one can choose an alternative way of enjoying art during the Biennale, when both next to and further away from the event's main venues – the Giardini and the Arsenale – various satellite events (Eventi Collaterali) are also being held. By visiting these events, one also gets a chance to wander along the lesser-known parts of the city. 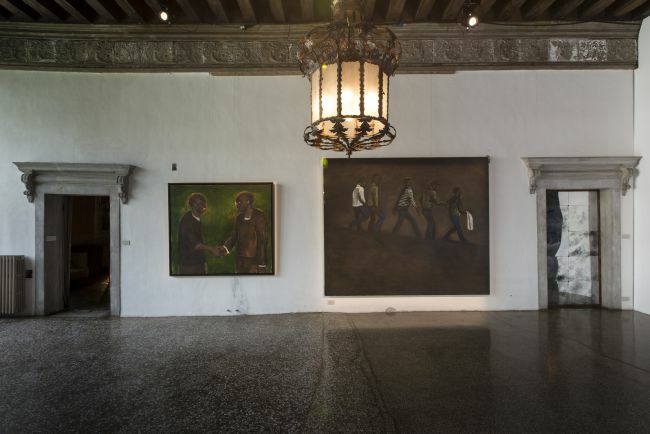 A total of 48 Biennale satellite events have found a place among the city's grand palazzos, museums, hotels and even churches, while 50 exhibitions independent of the Biennale are being held in various permanent art institutions located around Venice. Don't even hope of finding a logical algorithm explaining the city's layout – you are bound to get lost at least once. Here, the art isn't handed to you on a silver platter – there's a touch of the excitement of gambling in finding it, and when you do find it, you are richly rewarded indeed. Regarding “eating from a platter”, another hurdle to take into account as you reach out to grab a “serving of art” are the long lines to get into the exhibitions – which have all been gratuitously advertised in the various media outlets and fliers. And it just might turn out that, after having waited out a seemingly endless line, the exhibition didn't even appeal all that much to you. But even these sorts of disappointments are part and parcel of the spectrum of feelings one should experience during the Biennale. There's another inspiring side-effect of hunting for satellite events – namely, on one of the many tiny street corners it is quite likely that you will run into another art-lover who has gotten lost, his/her face full of confusion, a map in one hand, and a guide to the exhibitions in the other. Sharing the struggle to find the sought-after exhibition, and comparing notes on what has already been seen, can serve as the foundation for a really good discussion on art. Where else can you talk about art with a stranger, if not in Venice? It is already being whispered-about that this year's Biennale has gone into orbit around China – and not only because of the many Chinese dissidents being presented in the national pavilions of other countries (including the German exhibition's main feature – Ai Wei Wei and his 2013 installation Bang ) – but also due to the number of satellite exhibitions featuring Chinese artists. The largest of these is Voice of the Unseen, with 156 Chinese artists participating; however, an insight into Chinese contemporary art can also be seen in the exhibitions ‘You (you).’ – Lee Kit; Mind Beating; Ink Brush Heart, XiShuangBanNa and The Grand Canal. The already-mentioned Ai Wei Wei reminds satellite-exhibition-visitors of his presence in two separate shows: S.A.C.R.E.D. and Straight. 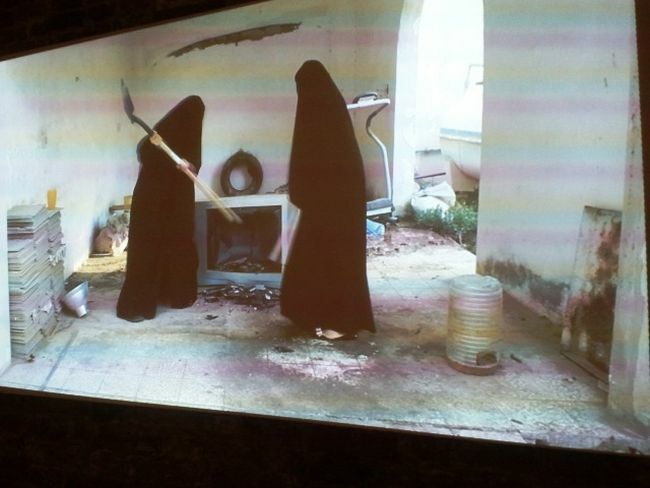 One of only two of Ai Wei Wei's solo shows in 2013, S.A.C.R.E.D. (2011-2013) is housed in the 17th century church Chiesa di Sant'Antonin. Strangely enough, it is forbidden to photograph the church's central nave, which contains the exhibition. Sanctions, denial and self-expression are articulated in the exhibition through six 1.5-meter-high metal containers – these contain dioramas in which the artist has directly documented his 81-day imprisonment in 2011. With an almost God's-eye view, through a peephole and some miniature windows we can see the hyper-realistic daily scenes of life that took place behind the door of cell No. 1135. What we see speaks to us on an emotional level: Ai Wei Wei being accompanied by two uniformed guards as he showers, as he uses the toilets, and so on... The placing of the exhibition in the church is no accident – here one can draw parallels with the Stations of the Cross, at which both Christ and Ai Wei Wei play the martyr. At the same time, a dialog is constructed between the historical church as Venice receives a greeting from modern-day China. The exhibition S.A.C.R.E.D. is closely linked to Wei Wei's legendary installation Straight (2008-2012), which was resonantly followed by the artist's conspiratorial arrest. The installation, with which Wei Wei showed disdain for the ruling regime in China, has been reconstructed and exhibited in the Zitelle Complex. It is made up of several tons of steel armature that was left after the collapse of schools during the devastating 2008 earthquake in Sichuan Province (during which 5196 school-children were killed). Weiwei straightened out the girders, clearly indicating the constructions' non-conformity to safety standards – and placing the fault on the shoulders of the corruption-addled government. Whether or not the artist has visited the Biennale or has yet to, or if he is again fighting the state – is not known, but at Venice's contemporary art mega-exhibition, this “Andy Warhol of Beijing” continues to make one ponder how important a snapshot of contemporary life can be in contemporary art. Katja is a real-life Russian girl who spent the first 13 years of her life in a Russian Orthodox nunnery, and then later entered the reality of metropolitan Moscow. Katja became involved in an underground extreme subculture that was into experimentation with the flesh and body modification. Now, a chronicle of Katja's life can be read in the physical features of her face and body. American artist Bart Dorsa has captured this history in photo essays that highlight the meeting point of these two different worlds. 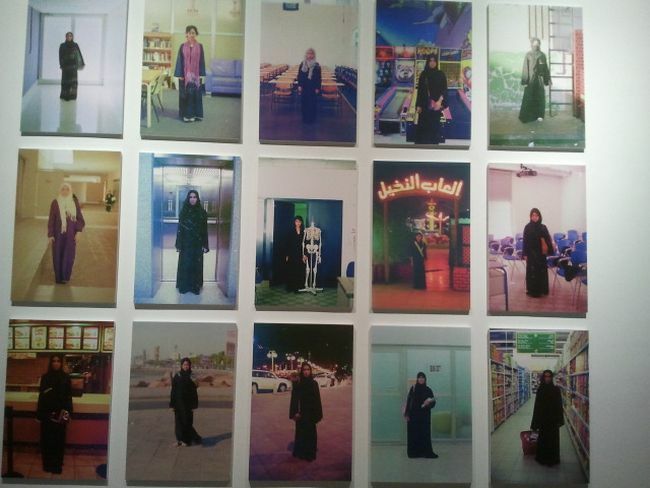 The psychological portraits make me involuntarily recall the oft-heard myth that a photograph can steal a person's soul. Later, as I read the description of the exhibition's concept in the catalog, I realize that this belief is also held by the artist himself. 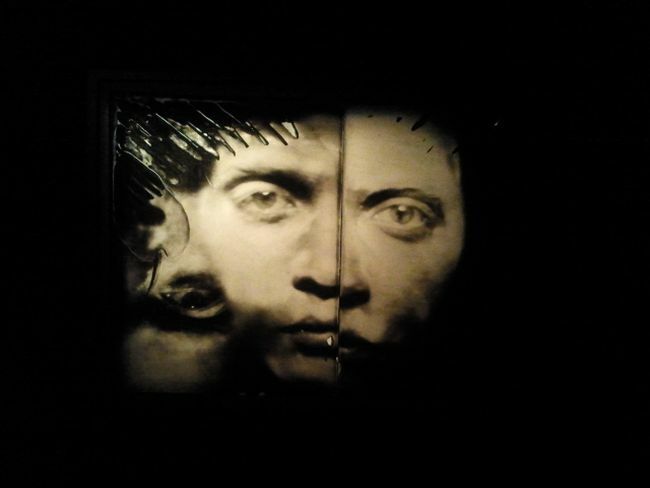 The exhibition also allows you to acquaint yourself with the century-and-a-half-year-old wet plate collodion process, which the artist has carefully studied and later experimented with, through the use of various emulsions, lenses and cameras. In serving as a mirror of contemporary culture and society, context is practically always very important in contemporary art. The Moscow Museum of Modern Arts' exhibition Lost in Translation, part of the official satellite program, will probably be most salient to that generation of Eastern Europeans that experienced the soviet era. Emotional flashbacks are guaranteed! Whether or not it will be “lost in translation” to the international audience, as well as to those who were born behind the Iron Curtain in the second half of the 80s – is another question... A part of the younger generation may be familiar with the phenomenon of communal flats, the soviet TV series “Seventeen Moments of Spring”, and the following sort of Russian humor: “Stirlitz opens the refrigerator. The light goes on. Stirlitz closes the refrigerator. The light goes off. Stirlitz opens the refrigerator – again the light goes on. Stirlitz closes the refrigerator – again the light turns off. That is a refrigerator – Stirlitz decides,”... But if they end up not “getting it”, will they have the patience to read the contextual and conceptual information posted next to the works...? In the context of this exhibition, it is notable that it is located in Ca'Foscari University, which has a Slavic Studies Department – a fact that accents the educational nature of the exhibition. 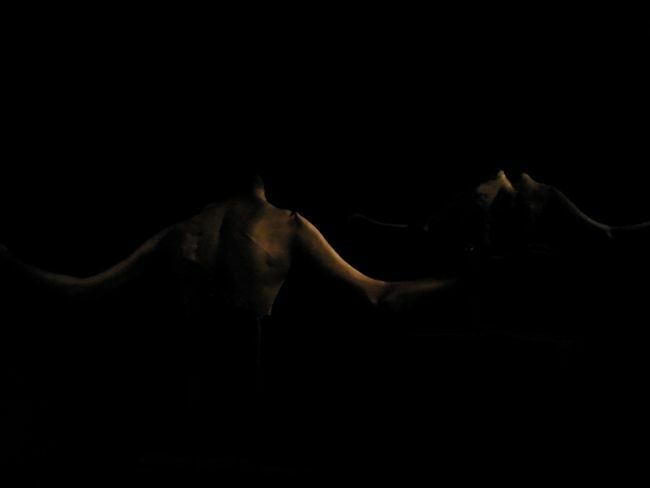 In Anna Yermolayeva's video work A Three-Minute Survival Attempt, we see the un-tippable Vanka-Vstanka dolls dancing around. 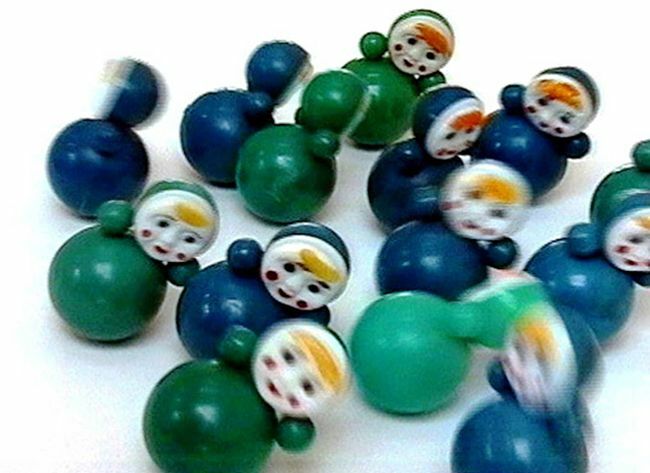 This mass-produced plastic toy was, quite possibly, the very first plaything of every single child in the Soviet Union. Alexander Pushkin's fairy-tale of the golden fish (first published in 1835), as interpreted by the painterly duo of Vladimir Dubosarsk and Alexander Vinogradov, alludes to the utopian wish fulfillment that can also be seen in post-soviet Russia. The exhibition also features Alexander Kosolapov's legendary piece Malevich-Marlboro, in the description of which it is explained that after the 1980 Summer Olympic Games in Moscow, forbidden foreign-brand items appeared on the Russian black market – including Marlboro cigarettes. As we know, something else that was forbidden was any kind of avant-garde, including the suprematism of the artist Kazimir Malevich. Leonid Sokov's The Meeting of Two Sculptures has been placed in the lawn of Ca'Foscari: the revolutionary leader Lenin (monuments to whom were in the squares and parks of every city in the Soviet Union) meets L'Homme qui marche (“The Walking Man” – a mid-century art icon that symbolized worry about the future and fear of the Cold War ), by Swiss artist Alberto Giacometti. The 15th century Palazzo Contarini Polignac is a destination in and of itself. The Palazzo indicates the Venetian turning point of leaving the gothic style for that of the early renaissance. 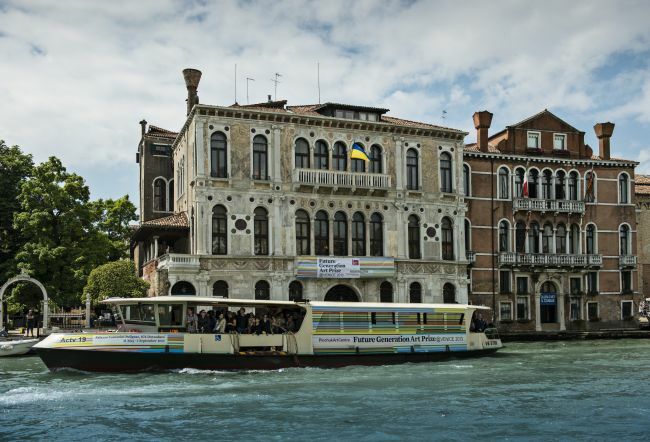 Architect Giovanni Buora built the impressive stone and marble facade that faces the Grand Canal. At the start of the 20th century, it came into the ownership of Winnaretta Singer, well-known patroness of the arts and sciences, and daughter of the legendary sewing machine manufacturer. In her time, the Palazzo hosted more than one icon of the art world. This year, for the first time, the doors of the colorful building have been opened to contemporary art and, quite possibly, its future stars. As one of today's most stable shining stars, Damien Hirst, has said: “You never know who could end up being the next Picasso...” So that we could better orient ourselves in which direction to best search for these new heavenly objects, the Ukrainian millionaire and philanthropist Victor Pinchuk has, since 2009, established the international Future Generation Prize, for young artists ages 18 to 35. In terms of emotional context, especially notable is the painting by the winner of The Future Generation Art Prize 2013, British artist Lynette Yiadom-Boakye (1977). In her piece, light seems to struggle with darkness, but then intensely bright accents of color break into the reserved color palette, bringing to attention the dark-skinned silhouettes that are in the forefront, who would otherwise drown in the dark whirlpool of the night. And for a moment, it brings to mind Goya... Also interesting is the piece by the winner of the Special Award, Rayyane Tabet (1983), from Lebanon – the use of architectural language in a transformable installation that reflects the complex social and historical context in his homeland. A wooden set of toy blocks has been reinterpreted into 4000 concrete pieces. 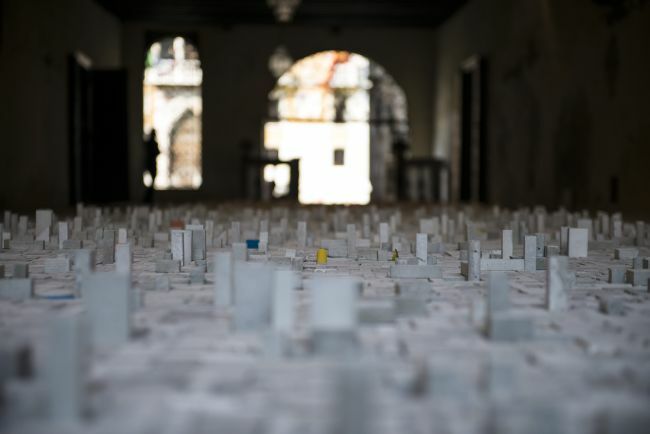 The miniature city built from the blocks, and the ease with which it is knocked down, hints at the buildings' fragility and, perhaps, at the ruins that are left behind after the Hezbollah terror acts that happen in the cities of Lebanon. Now, in Venice, it is possible to get a look at the current transformations going on in Saudi Arabian art, and to hear the powerful messages of its newest generation of artists – in which can be felt the hope that these messages won't simply disappear like voices in the desert...The contemporary art parade RHIZOMA (Generation in Waiting), organized by the independent artists' initiative Edge of Arabia, is something truly special. The ten-step-long street that leads to the Spazio Lightbox exhibition platform – the room for the Who is Alice? exhibition, is like the proverbial rabbit hole into which one can disappear after having bored through the reality of the Rialto Bridge and the tourist market. Korea, which already has a national pavilion, has also opened a satellite exhibition during the Biennale here – a real phantasmagoria of Korean contemporary art. Who is Alice? is a journey into the fantasy worlds of 15 of Korea's most salient artists. Overstepping the bounds of time and space, the exhibition's introductory piece tells about an unknown, unending energy from an unknown source – that moves a pendulum in the kinetic work of art Pendulum of Secret, by the artist U-Ram Choe. The innumerable moving lights on the ceiling make one think that mechanical things could have the living pulse of an organism. By combining the beautiful facades of several different structures, a wonderful building of dreams has been created in the 3D-hologram model Dreams of Building 10, by the artist Myung-Keun Koh. 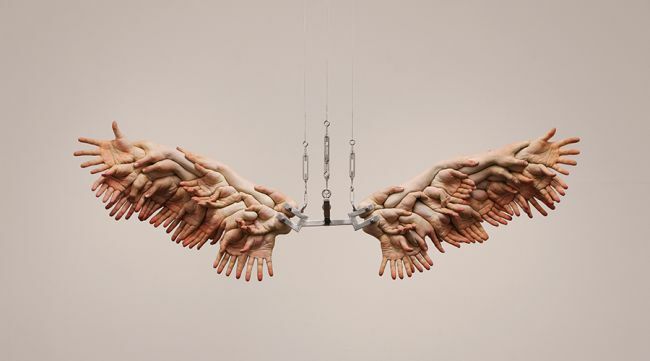 In The Wing, by the artist Xooang Choi, the myth of Icarus has been referenced – in the way that the hyper-realistically crafted human arms entwine and grasp each other as they form a surreal sculpture of a pair of wings. Meanwhile, the artist Doo-Jin Kim has undressed – to the bone – the characters of The Youth of Bacchus, by the 19th century neo-classicist William-Adolphe Bouguereau. 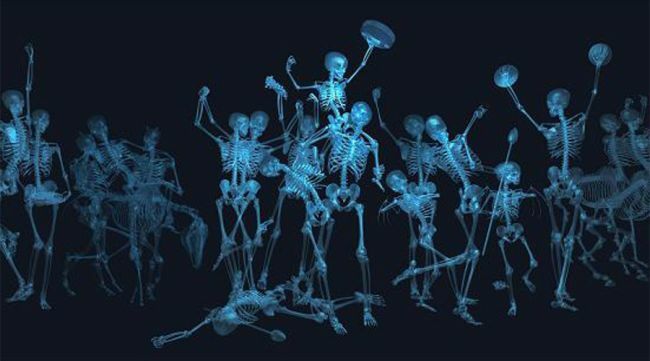 All that's left is are the character's skeletons, as seen in a 3D, large-format piece – the contemporary version of Bouguereau, one could say. In the exhibition Who is Alice?, the frameworks of time, space and flesh have been completely ignored, leaving only unconditional fantasy. For those who have an affinity for the force of fire, the Biennale satellite exhibition Glasstress, White Light / White Heat is definitely worth a visit. Fire – which has the ability to transform solids into liquids, and which can change molecular structures so that they can again create new solids. Quite possibly, the most beautiful result of these games with fire is glass. Randomness, surfaces, color, clarity, reflections... A whole intergalactic world of fantasy. At times cool, then frozen solid; at times warm, even almost delicious... sometimes it just seems like... Glass is deceptive and variable, depending on its position and the angle from which it is being looked at. Different artists from around the globe have taken part in this exhibition; for some of them, this is their first time working with glass. What better place for a story about glass than Venice – which is not far from the Murano glass workshops. The exhibition of New York conceptualist Rudolf Stingel's works in the Palazzo Grassi (which is owned by the famous French collector and owner of Christie's auction house, Francois Pinault), has something in common with Venice itself. First of all, labyrinths that can totally disorient you; secondly, an absolute saturation of color and texture in every square centimeter, which creates the illusion that an intense and painterly photograph can be achieved without even trying – just by carelessly aiming the camera and some random target. For the first time in its history, the Palazzo Grassi has given over all of its space – more than 5,000 square meters – to one artist, and in turn, he has not hesitated to make use of every last square centimeter. The three floors of the Palazzo Grassi have been completely transformed. Every corner of the Palazzo (stairs, floors and walls) has been adapted to the artist's usual manner of exhibiting. With the help of Oriental carpets, the space has been transformed into a homogenous plane on which Stingel has put 40 conceptual paintings on display. Some of them were made specially for this exhibition, and were inspired by the cultural context of Venice. Another of Pinault's holdings – the contemporary art space Punta della Dogana, which was adapted for exhibition use in 2009 by the famous Japanese architect Tadeo Ando – is now seen as one of the symbols of 21st century Venice. Alongside the impressive exhibitions, through the windows of the one-time warehouse one can see a centuries'-old man-made – and thousands of years'-old nature-made – living exhibit. At the tip of Dorsoduro Island, where the Grand Canal intersects with the Giudecca Canal, you can see a complete silhouette of the city, as well as a comprehensive scene of the city's water-transport system, in action. The key work in the Prima Materia exhibition is “dialog”. First of all, it is a dialog between the exhibition's two curators, Michael Govan and Caroline Bourgeois, which resulted in the selection of 80 works and 30 artists within a decades-long time-frame. It is also a dialog between important art movements of their respective times, such as the Japanese conceptualistic movement Mono-ha, and the Italian movement of Arte Povera. In the humor-filled works of Llyn Foulkes – in which American morale and politics are criticized, and icons such as Elvis Presley and Mickey Mouse are caricatured – a marked role has been given to experimentation with various textures, such as human hair, for example. Algerian conceptualist Adel Abdessemed has turned towards the theme of religion, having set up five statues of Jesus on the Cross; titled Décor, they are made of barbed wire – of the kind used at the terrorist detention camp in Guantamo Bay. Décor makes one think about how simple it is to take symbols of danger and transform them into pillars of Christian love and faith. The exhibition of the pop-art maestro, Roy Lichtenstein, Sculptor, in the Magazzini del Sale – a one-time salt warehouse – is a historical event. 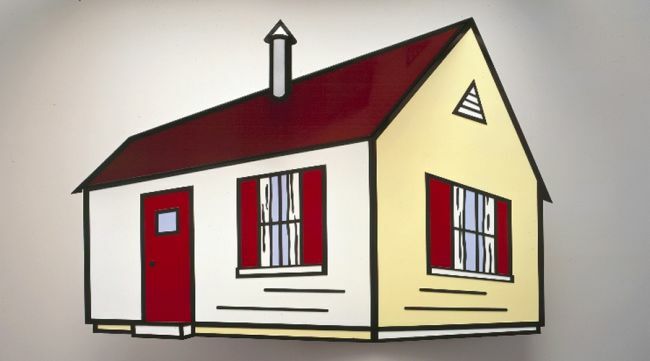 It is the first-ever European showing of 45 of Lichtenstein's works – drawings, collages, wooden models and bronze and fiberglass sculptures made from 1965-1997. Displayed in an ascetically white setting, the bright colors, strict contours and loud cliché-compositions of Lichtenstein's works hit you like a slap in the face. Through the windows of the Museo Correr building, one can take a good look at what is going on in “Europe's most beautiful living room”, as Napoleon once labeled St. Mark's Square. The works of British sculptor Sir Anthony Caro have been put on display in the airy galleries of the museum; each room contains one piece. Caro last visited Venice during the 1999 Biennale. In this year's exhibition, visitors can view the artist's early sculptures – in which one can see the influence of his teacher, Henry Moore, as well as the artist's own innovations from the 1960s – and his newest pieces, such as Venetian and River Song (2011/2012). Caro's famous large-format steel pieces, Red Splash (1966), Garland (1970) and Cadence (1968/72), have also been set up. With the neo-classical building in the background, Caro's magic ability to both feel and release the expressiveness and poetics of industrial materials is clearly revealed to all. * A large portion of the satellite exhibitions are free of charge. The exhibitions listed after the “*” are not a part of the Biennale's official satellite program, and therefore have admission fees.